Doubly terminated crystals of Fluor-Buergerite on matrix. They show a combination of a dominant ditrigonal prism and rhombohedral terminations. 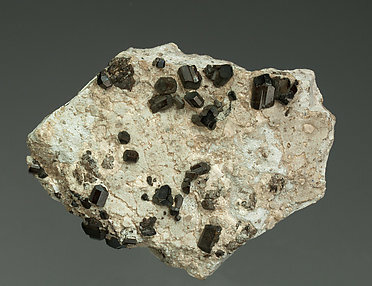 The crystals are very bright, have dark a brown, almost black, color with translucent reflections. The sample, from the type locality for the species, is with a label from John. S. White that indicates it previously was in the Luther Thomas collection. We’ll send both labels to the buyer.